For as long as Mike & I have known each other, we’ve sought adventure and unusual experiences in all our travels. We’re fun-junkies and any chance to break from the “real world” and enter a new domain is a chance we’ll take! Our demanding jobs and limited funds have restricted us to trips close to home, but we’ve always looked for interesting (and often unique) options for leisure activities. 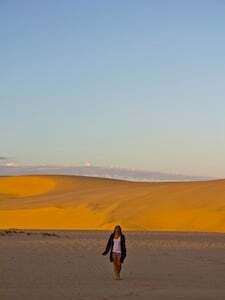 Our honeymoon was going to be different than our usual vacations because we finally had enough time off to do something totally over-the-top and with Traveler’s Joy to support our plans, we knew Africa was calling us! We’re big-time scuba divers and we both love animals, so Africa offered the opportunity to have both a safari experience and a beach vacation by just traveling a few hours between countries. Since we got married on May 14th and Africa is on the Southern Hemisphere, the seasons were opposite for us so it was the beginning of winter there. Luckily, African winter days are a balmy 80-85 degrees, even though we knew it would be chilly at dusk and dawn. We were sweating excitement when 2 days after our wedding, we boarded the plane to Johannesburg. The flights were over $2,500 per ticket for coach, so we used Amex miles (a gift from my parents) to get the tickets instead. After 15 hours in the air – through which we mostly slept upright - we landed safely and made our way through customs to connect to our next flight to Hoedspruit, near Kruger National Park. Somehow while searching for our connecting terminal, we foolishly separated. This, I advise against strongly because there are lots of panhandlers in the Jo’burg airport. They look for lost tourists so they can solicit payment for giving directions. Of course I was an immediate target, walking around looking bewildered and might as well had been wearing a sign that said “clueless foreigner” on my forehead. I was nervous and my heart was thumping as I searched for South African Airways terminal hoping to reunite with my husband there. We’re street-smart New Yorkers so we were able to handle ourselves, but it would have been a lot less stressful to stay together and avoid the drama of being lost. A simple but firm “NO THANK YOU” was enough to push away loiterers looking to prey on unsuspecting travelers but who really wants to even go through that exchange in the first place? Thank goodness we found one another at the check-in counter. I breathed a huge sigh of relief and gave Mike a monster hug before we were off to our next stop. Once there, we found the driver arranged by our host and made the three-hour drive to our destination, Garonga Safari Camp in Nelspruit, South Africa. Garonga isn’t a typical “camp." First, we drove a long way through the brush to find the entrance, which resembled a rustic resort with a guardhouse at the gate. As we made our way to the main lodge, we were in awe of the wilderness around us and couldn’t believe we’d finally made it. Mike squeezed my hand and let me know he was just as psyched as I was to be there. We were greeted by the super-friendly staff and offered a snack and drinks before we were given the chance to jump on the next game drive (which was leaving in 15 min). We were pumped! We barely had a minute to survey our gorgeous “tent” because we quickly changed and ran to the land rover, which was to be our chariot. Our ranger and tracker were two native South Africans named Moosa and Raoul, both of whom had been raised in the area. They were incredibly knowledgeable about the land and animals and even took the time to explain local customs, languages, and tribal differences. We learned how to make a toothbrush from a tree branch and how to play a local game, which involved spitting impala dung as far as you can get it to fly! My husband actually tried that one and it wasn’t pretty. I can still see the ridiculous look on his face as he placed a dung pebble in his mouth and got ready to spit. Ironically enough, he actually won the competition against two native South Africans! I think they were pretty good sports about it but I’ll bet they went home that night to practice for the next time. The other two couples on our drive were from England, as were most guests at the camp, and they were a kick. We loved their dry sense of humor and they seemed to get a laugh out of our American wit and banter. It felt like we were traveling each day with friends as we got to know our group and it wasn’t long before we starting picking up each other’s accents and vernacular. Within the first 10 minutes on our first ride, we spotted a mother and baby rhino grazing in the brush. It was like seeing a couple of dinosaurs! We couldn’t believe our proximity to these creatures or their calm demeanor with us being so near. Talk about an adrenaline rush! I was so flooded with excitement and amazement that I nearly cried. Mike was beside himself from the beauty and the thrill. We suddenly felt closer to one another to experience such a marvel together. Not long after that we came across a pride of lions resting in the grass. They were wary of us and kept a calm but attentive eye on our car, though we remained seated and made no sudden movements. Adrenaline rush No. 2 was upon us and we had to fight to keep our composure. After all, how often in life does one get to drive right up to the king of the jungle on his own turf? One male and five females glanced languidly at us, when suddenly a cub popped his head up from behind a female. I squeaked a bit from the excitement and Mike shot me a look that said, “Please don’t get us eaten!." The rest of the drive brought us through herds of elephant, giraffes, antelopes and even the occasional vulture. There were many baby animals for us to see as well and that was an extra bonus. For a minute we thought we’d been dropped in the middle of a National Geographic special. I kept waiting to hear a narrator’s voice describe the scene for viewers. Near the end of the drive, we stopped to watch the sunset and have cocktails and snacks (and a bathroom break) before the journey back to camp. Bathroom breaks, by the way, include finding a spot behind a bush and doing your business like the animals do. So you really must watch out for little critters in the brush before you relieve yourself. Of course, my first choice turned out to be right above an anthill and I almost wiped out the entire colony by accident (no pun intended). Back at camp, we showered and changed before our guide picked us up from our luxurious tent, equipped with private bath, electricity, king bed, most hotel amenities & lovely décor to go to dinner. Each night we met with all the other guests in the open-air lodge for drinks and hors d'oeuvres to recap the day. The chef came out nightly to announce the menu choices, at which point my hubby felt it was his job to ask for all the ingredients in each dish. The lovely chef indulged him and gave the full run down while he sipped his scotch on the rocks. Since I’m a picky eater and many of the choices were wild game, they prepared special vegetarian dishes for me, which were absolutely delicious. My husband enjoyed the local cuisine, trying everything from wild boar to ostrich to kudu. The word ‘accommodating’ isn’t enough of a compliment to describe the extraordinary staff. We were both happy beyond happy. After dinner, we were ushered on foot back to our private tent by a guard. Mike spotted a bamboo spider on the way and actually tried to catch it like a 7-year-old boy might, but thankfully our guide stopped him before he got himself a nasty bite. I married a daredevil so sometimes I need to keep a close eye on him so he doesn’t get himself into too much trouble! The camp isn’t fenced in and animals can freely roam the grounds, so they’re careful about the guests’ safety - including those with spider infatuations and a penchant for disaster. We were zipped in to our tent and our remarkable day ended there. We had a 6 a.m. wake-up call coming for our first game drive the next day. Before the sun came up the next morning, I found that my curious husband had snuck out of the tent with a flashlight to do some exploring on his own. Of course that’s forbidden for safety purposes, but he did it anyway and got a few snaps of some of the critters that creep before dawn. 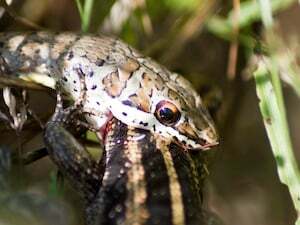 When he came back with pictures of a snake capturing and devouring a lizard, I wasn’t sure if I should yell at him for going out there or congratulate him for getting such great shots! I don’t recommend doing such a thing because it’s dangerous, but he was very lucky, although the next time I’m sleeping with one eye open in case he gets any ideas. When the lions are roaring in the brush and you don’t know where your other half is, you can bet it makes you pretty nervous! I did snitch on him though so they’d scold him enough to stop him from doing it again. Of course, each day at Garonga offered a new adventure and he was quickly appeased. We went off trail and tracked a leopard, followed a mother lion with her cubs, witnessed a cheetah and her babies catch and kill an impala, chased a herd of zebra. The adventures seemed endless. Even the insects were astounding to behold. The camp’s watering hole attracted wild visitors throughout the day so we’d get views from our tent of whichever animal was thirsty enough to show up for a drink. I woke up one afternoon from a snooze on our hammock to find a herd of elephants staring at me from across the water. What a nice way to end a nap! A day later, we got the opportunity to take a micro-flight over the brush so our safari experience was enhanced with an aerial view. The animals looked like toys from such great heights and the scenery just captivated us. I couldn’t stop grinning as we swooped over the plain and I breathed in the freshness of the air. The pilot let me steer for a few minutes, which was a little reckless but also pretty awesome. I giggled like a child as we dipped and then leveled out. We loved it so much that we tipped the pilot a bit extra to take our driver (who was also our ranger) up in the plane so he could share in the experience. We found out he’d never been in the air before and we were happy to be able to offer him the chance. The smile on his face when he touched back down was such a wonderful gift to us we were glad he took us up on the opportunity. Every moment was more spectacular than the last and we wished we never had to leave. Even as I write, I feel like I’m back there, spellbound all over again by the majesty of the land. In my heart I know I do little justice in describing the beauty of this country, but I’m grateful for the chance to share my encounter with the magnificence of South Africa. After four days on safari, we took the journey back to Kruger airport and made our way to Vilankulo, Mozambique. There, we hopped on a small plane that took us to Bazaruto Island’s, Indigo Bay Resort. This time it was me that squeezed Mike’s hand to let him know how excited I was to be there. He gave me a wink in return and I thought it was pretty cute. A short walk through customs led us to a bus that drove five minutes to our destination. As we entered the resort, we found the surroundings to meet five-star expectations and the staff too, were exceptionally welcoming. A quick but efficient meet and greet with the director gave us an overview of the expansive grounds and a list of activities available. For the next eight days we’d be restricted to Bazaruto unless we organized a flight back to the mainland. Of course, we immediately dropped our things at our private, beach cottage and bee-lined it to the dive shop. We scheduled our first dive for the following morning and also set up dune boarding and a culture drive. We tried to arrange horseback riding but unfortunately it was the time of year for the horses’ inoculations so they were out of commission for two weeks. That was a bummer since a ride on the beach would have been fabulous. I wish they’d have let us know that when we booked the trip because it was one of the main reasons we chose this resort over others. I got over it quickly though and looked forward to the other activities. Later that day, after a lazy poolside lunch, we made our way to our room (about an eight-minute walk from the lodge) to find it was splendid. A bottle of champagne and chocolate covered strawberries were waiting for us, along with a petal-filled bubble bath surrounded by candlelight. We enjoyed all three and felt relaxed yet refreshed at once plus a little lovey-dovey with all the romance in the air. Dinner was to be served between 6-9pm each night. While the number of guests often dictated whether we were offered a buffet or a la carte meal, we hadn’t chosen the place for the food so we were fine with either. The staff spoke mainly Portuguese and a little English but we managed to communicate just fine. Simple cocktails were the best as they weren’t very adept at making the more complicated ones, but we did get to try something they call elephant’s milk, which is sort of like Bailey’s and Kahlua combined. It was good and offered a nice buzz after a couple of shots! By the way, another way to make friends is to ask other guests if they’d ever tried elephant’s milk and then order them up a taste! Our dive the next morning was unlike any we’d done before. The Indian Ocean looks like the Caribbean Sea but beneath the surface lies a spectrum of coral and sea-life that surpassed all of our expectations. Winter conditions brought the water temperature down to around 72-76 degrees Fahrenheit but we were fine in 5mm dive suits. Underwater, it seemed that all the creatures were magnified! Parrotfish and wrasse, triggerfish and lobster, clownfish and anemones were all huge in comparison to what we’d seen in the past. Their colors were so much more vivid and so different than those close to North America. It was surreal. Even with low visibility, the diving was remarkable. Our dive master even found a small octopus and captured it long enough to let me hold it for a few minutes. I was having a once in a lifetime experience and actually realizing it while it was happening. We dove nearly every day that the conditions allowed and each dive was more beautiful than the last. The crew unfortunately didn’t speak English well enough to really educate us on the sea life so we read through the books in the dive shop to learn more about the flora and fauna we came across underwater. The shop’s library made for good poolside reading. On days when we couldn’t dive, we found other ways to stay entertained. The resort offered us a free sunset, champagne cruise, which we gladly accepted. We boarded the boat and sailed off with our captain. It was a no-frills craft but it was well equipped with fresh fruit, nuts, bread and drinks. It was an amorous way to begin the evening and we enjoyed every second of it. I remember thinking to myself that I was the luckiest girl in the world to be in such a beautiful place with the love of my life. One night on the way to dinner, a small creature jumped from one tree to another across our path. We shined our flashlight on the branches to discover it was a bush baby! After that, my husband made it his mission to look for the animal every night on the way to and from our meals. I must have told him to forget it 100 times, but he wouldn’t listen and searched for it with such persistence I was actually impressed. On the very last evening, just as we’d given up hope of seeing it again, Mike spotted it and was even able to snap a picture of its peculiar but adorable, little face. He got the prize he’d spent all week trying to win and we celebrated the victory with a big kiss and a hug. Our culture-drive through the island village and showed us first hand how primitive yet community-oriented life on Bazaruto really was for its inhabitants. The people were kind and genuinely happy to meet visitors and it reminded me of a quote I once read by Hugh Downs who said, “A happy person is not a person in a certain set of circumstances, but rather a person with a certain set of attitudes”. I was glad to have the chance to witness such a different way of being and it helped me appreciate the privileges in my own life. We brought soda and snacks for the kids (conveniently snagged from the breakfast buffet & our mini-fridge) and they took pictures with us and showed us their school and where they grow their food. They were proud of the little that they had and I was flattered that they felt comfortable enough to introduce us to their world. It was a simple life but one that displayed a great sense of togetherness and appreciation for the land and one another. Cashew trees grew wildly all around and my husband was dying to try a fresh picked one. Despite the warnings of our guide who told us fresh cashews are covered in acidic juices and are inedible in that state, he bit down into one anyway. We had to laugh as he guzzled an orange soda to put out the fire in his mouth. The kids got a big kick out of it! Like I’ve said before… I have to watch him closely or he gets into trouble! Dune boarding was a blast. The dunes were so picturesque, it was like staring at a work of art on a wall. After a quick hike up one of the dunes, our guide waxed our boards and off we went either standing (snowboard style) or sitting (sled style) down the slope. It was tough to trek back to the top after each ride but it was tons of fun and the best part was falling didn’t hurt because we landed on sand! We went so often we had convinced half of the other guests to accompany us and by the week’s end, the entire guest roster was on those dunes. Competitions brewed and suddenly we found ourselves acting as deputy activities directors. Making friends is a snap when you find a common interest. The spa at Indigo Bay was next on our agenda and we both indulged in the opportunity to be pampered. My mother thoughtfully called ahead and arranged for a $500 spa credit for us so we had our pick of treatments. Mike got a body scrub and facial and I got a massage and pedicure. Except for a few pesky mosquitoes (which didn’t bother us because we had bug spray and took our malaria tablets), the spa was amazing. It was situated on the highest point of the island so after our treatments, we got to sit in the plunge pool and watch the sunset. It was truly a blessed moment for us as we reminisced about the incredible last few days. Before we knew it the week drew to a close and it was time for us to make the long journey back to NYC. We reluctantly said goodbye to our new friends (both guests and staff) and exchanged e-mails and promises to keep in touch. It was a sad departure but we left feeling fulfilled and content. The entire trip cost around $11,000 with charters, accommodations, tips, spa and transport fees but it was a dream come true and one that we’ll never forget. We vowed to make another journey to Africa again and do a longer safari in a different country and even try another island off the east coast of the continent. The next time we’ll switch seasons and visit during the summer since that may offer an even greater safari and beach/diving experience. There’s a reason they call Africa “The Motherland” and if you ask me, it’s because it’s the kind of place you want to go back to again and again and again… and we certainly will.